Going into spring training 1989, Edwin Marquez was coming off a year where been described as a top Angels catching prospect, but one where he'd only played 13 games. So, when players returned to camp that year, but Marquez couldn't. That couldn't have been of much help to the backstop. It was Visa problems for the Venezuelan native that stalled his return, according to the Los Angeles Times. His arrival was stalled the year before, as well. He finally arrived in 1989 a month late, according to The Daily News of Los Angeles. Unfortunately for Marquez, he would only have to worry about visa problems for another year. His last year in professional baseball would come in 1990, his career ending short of the majors. 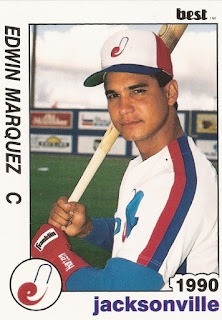 Marquez' career began in 1983, signed as a free agent by the Angels out of Venezuela. Sent to short-season Salem, Marquez did poorly. For the Salem Angels of the Northwest League that year, Marquez got just 33 at-bats, hitting .091. He returned for 1984 and part of 1985, hitting .250 in 48 at-bats in 1984 and then just .215 in 79 at-bats in 1985. He made it up to single-A Quad City for the rest of 1985 and all of 1986, finding his bat in 1986. That year, he hit .280 with five home runs for the QC Angels. That also earned him a promotion to AA Midland. At Midland, Marquez continued his tear, hitting .286 for the Texas League team. Then came 1988, a hint at Visa problems and injury. He earned a promotion that year to AAA Edmonton, after his early visa problems were solved. But he only got in 13 games. A sore hand in mid-July put him on the disabled list, according to The Times. When he finally got into camp in 1989, he started his season. But he would split the year between Edmonton and single-A Palm Springs. He hit .260 at Palm Springs, including a July double that gave Palm Springs the lead against Modesto, according to the Modesto Bee. Back at Edmonton, Marquez hit .293 in 32 games, but it was his final year with the Angels system. For 1990, Marquez started with the Montreal system, then jumped to Houston. He played at AAA Indianapolis and AA Jacksonville, briefly both places. He hit .163 at Indianapolis. With the Houston system, Marquez played 18 games at AAA Tucson, hitting markedly better, at .339. But Marquez was done. He wouldn't return for 1991.